Fig. 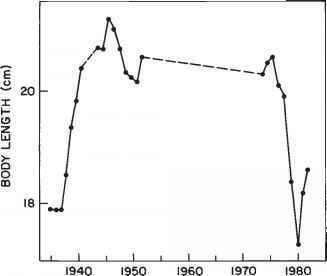 14.10 Trends in catch of Far Eastern, Californian, and Chilean sardines, 1910-87.
the nominal catch of the Pacific sub-population of Japanese sardine during 1951-81. The change in the former in the Ashizuri subpopulation is also shown for 1977-81 (Watanabe, 1983). 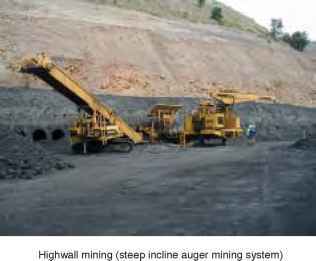 and have been at very high levels in the 1980s. Yet, catch differs from abundance. In order to establish a relationship between catch and abundance, Fig. 14.11 (Far Eastern sardine) and Fig. 14.12 (California sardine) are shown. 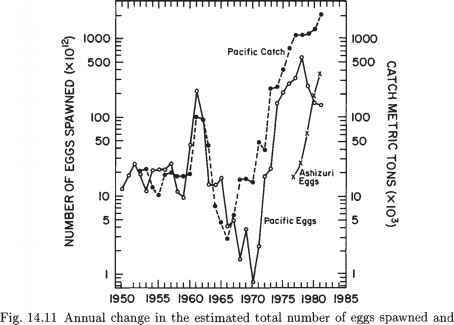 Figure 14.11 shows estimates of the total amount of eggs produced from Pacific and Ashizuri subpopulations in the period 1949-82. The total amount of eggs can be regarded as a measure of the spawning biomass. As one can see, the trends in the amount of eggs accord well with the trends in catch. The estimates of the spawning biomass of the California sardine between 1790 and 1970 are derived from the scale-deposition rate in two anoxic basins (Fig. 14.12). 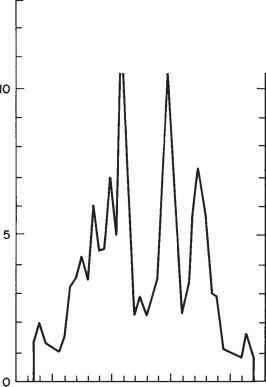 The trend in spawning biomass after 1910 is basically similar to that in catch as shown in Fig. 14.10. 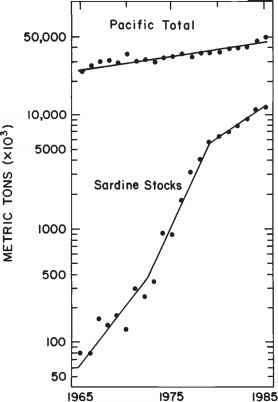 Figure 14.12 also suggests the important point that even before 1910, when there was no sardine fishery, the biomass of sardine showed a wide fluctuation. This implies that the population change in sardine resulted from natural causes and not from fishing pressure. Fig. 14.12 Revised estimate of the spawning biomass of the California sardine between 1790 and 1970 (180 years at five-year intervals) derived from the scale-deposition rate in two anoxic basins (Soutar & Isaacs, 1974). The Pacific sardine biomass remains the same as in Smith, 1978 (Smith & Moser, 1988). Large increases in the sardine catch are the result of an increase in biomass which is caused by a great extension of the spatial range of sardine. In the 1980s when the sardine stock was abundant, its geographic range was broad throughout the Sea of Japan and as far east as 173°W (Fig. 14.13). 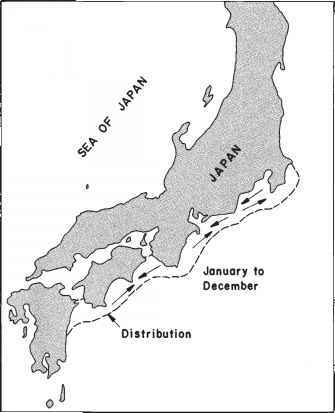 Around 1965, when the stock was at a low level, it was confined to a small coastal area along southern Japan (Fig. 14.14). In the period of low levels, the sardine was truly a coastal species, remaining in coastal areas and managing to maintain the species' survival. In those days it was even called the "illusional fish." In recent years with the population at its highest level, however, the range of the sardine extends throughout the Sea of Japan and eastward, well into the Pacific Ocean. According to experimental surveys, the distribution of sardine in a broad area of 35°-50°N and 155°E-173°W between June and August in 1977 to 1984 was confirmed by drift net, purse seine, and angling (Tokio Wada, 1988, personal communication). The sardine has made a dramatic transformation from a real coastal fish to a widely migrating pelagic fish. It was as if it had become a different species. Fig. 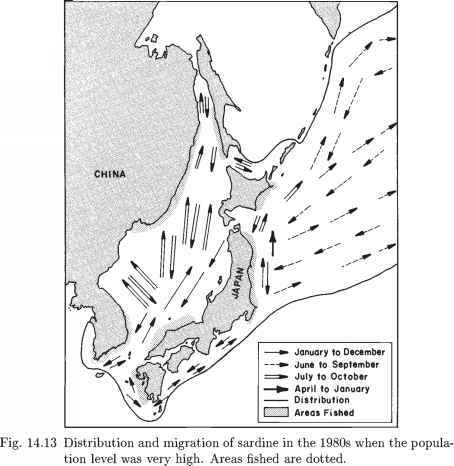 14.14 Distribution and migration of sardine around 1965 when the population level was very low. tions, devastating vegetation. In terms of biology, this event was the result of a "phase variation." This morphologically, physiologically, and ecologically variational phenomenon is observed in insects such as locusts and armyworms. Such insects are inactive, not making long-distance migrations, and their populations are usually very small when their environment has deteriorated (solitary phase). If, however, their environmental setting becomes ameliorated, not only do morphological characteristics (including body color) vary, but they also become very active, resulting in their swarming over hundreds of kilometers (gregarious phase). Entomologists once believed that the two types of locusts belonged to separate species because they were quite different in appearance. The outbreak of sardine populations might be considered as a fish population version of a phase variation. Another characteristic strategy of the sardine is its feeding niche. As Hyatt (1979) stated, most of the marine teleosts are carnivorous; there are few herbivores, in particular planktivores, among them. The sardine is one of the very rare species that can take phytoplankton with its elaborate filtering apparatus - gill-rakers. It can be said that when the population level of sardine is low, therefore, phytoplankton in broad open oceans are not directly utilized by fish. When the environment takes a more favorable turn, however, the sardine is transformed into a widely-migrating pelagic fish, dramatically extending its range by grazing over the open oceans. This leads to sharp increases in sardine populations. Fig. 14.15 Year-class-to-year-class change in the body length of three-year-old Far Eastern sardine (dashed line signifies lack of data). year classes of the Far Eastern sardine, such as 1935-37, exhibit slow growth rates and three-year-old fish were very small, with a mean length of less than 18 cm. As the stock size declined thereafter, fish became larger year by year and three-year-old fish of the poor 1941-76 year classes were very large, with a mean length of more than 20 cm. The sardine population once again increased and the three-year-old fish became very small. It is difficult to explain fluctuations in each sardine population by changes in the local or regional environment in which it lives. Winter values of sea surface temperatures (SSTs) averaged over the years 1980-85, minus winter values averaged over 1968-73 in the North Pacific (Fig. 14.16) show that, although SSTs decreased in the middle and western part of the mid-latitudes, they rose in the eastern areas. However, the two sardine populations in the Far Eastern areas and off the California coast increased rapidly between the two periods cited above. It is difficult to believe that different populations of a single species of sardine would react in opposite ways to the change in SSTs. Fig. 14.16 Changes in sea surface temperature over the North Pacific. Differences are winter values averaged over 1980-85 minus winter values averaged over 1968-73 (Venrick et al., 1987). What environmental change, then, might connect the variations in the three sardine populations? 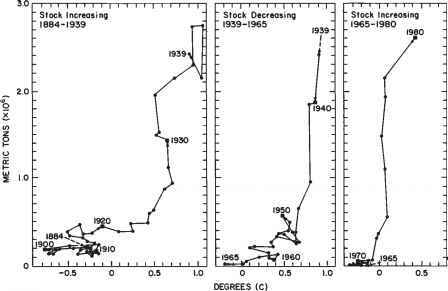 Figure 14.17 indicates variations in the annual mean surface temperatures as anomalies from the average annual value between 1876 and 1987 over the Northern Hemisphere. When this pattern of temperature change is compared with variations in catch, hence in abundance, in Fig. 14.10, one can see that the temperature changes are quite in phase with the population change. To examine the relationship somewhat more quantitatively, Fig. 14.18 shows a clear relationship for the Far Eastern sardine - when the temperature anomalies were positive, catch (abundance) was high. If variation in temperature is taken as a measure of climatic change, this could suggest that population change is affected by global climatic change. Fig. 14.17 Trends in anomaly of average surface temperatures in the Northern Hemisphere, 1876-1987. Two thin (thick) lines represent upper and lower bounds on annual (five-year running) average surface temperature anomaly (Meteorological Agency of Japan, 1989). Fig. 14.18 Relation of Far Eastern sardine catch to anomaly of mean surface air temperatures. Circles indicate mean values for respective year and squares indicate values 10 years apart (Kawasaki & Omori, 1988). There is a pelagic fish community composed of several large biomass plankton-feeding fish in each temperate area of the world's oceans. In Far Eastern waters the pelagic community comprises sardine, anchovy, jack mackerel, chub mackerel, and saury. Although sardine feed primarily on phytoplankton and secondarily on zooplankton, the anchovy's diet is comprised primarily of zooplankton and secondarily of phytoplankton; all the other species feed exclusively on zooplankton. Thus, the foods of these species overlap either partially or completely, possibly resulting in close interaction and competition for shared food resources. Fig. 14.19 Trends in catch of sardine, anchovy, jack mackerel, mackerel, and saury around Japan, 1926-88.
population began to rise steeply and, as a result, the catch from the community increased drastically, approaching six million metric tons in 1982. Through this process, a decrease in catch of fish other than sardine (from 2 million mt to 1.3-1.5 million mt) occurred, possibly indicating that it was caused by population pressure imposed by the sardine on other species. This suggests that the sardine may be the key species in the temperate pelagic fish community around Japan. It is evident from Fig. 14.19 that such variations of the pelagic fish community also took place from the 1930s to the 1940s, implying that the temperate pelagic fish community is strongly influenced by the sardine qualitatively as well as quantitatively. As seen in Fig. 14.20, the total catch of all marine animals from the Pacific had increased from about 24 million mt in 1965 to over 46 million mt in 1985. At the same time, the sum of the catches of the three sardine populations increased from 80,000 mt, only 0.3 percent of the total catch from the Pacific in 1965, to over 10 million mt, one fourth the Pacific total in 1985, indicating how great an effect the variation in sardine populations can have on fisheries production in the Pacific. Fig. 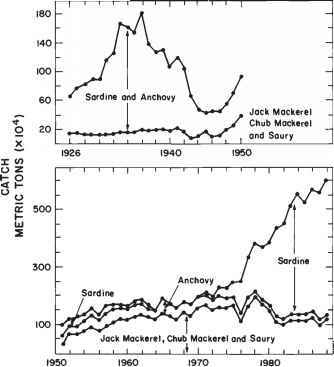 14.20 Trends in catch of all marine animals and that of sardine in the Pacific Ocean, 1965-85.